Abscesses – most horses will experience them at some point. An abscess is a pocket of moisture or pus that gets tender and sore in a hoof. While these are common in horse hooves, abscesses can be very painful and can cause lameness. Although an abscess will pass on its own, it’s important for hoof care professionals to employ proper trimming techniques afterwards so the damaged hoof wall can grow back properly. There are many causes of abscesses, whether it’s a change of environment from dry to wet, or a horse simply stepping on a rock in an awkward way. An abscess can happen when the coffin bone starts to degenerate and fragmented parts build up in the form of pus. It can move through the lamina all the way to the coronary band, where it visibly breaks out of the hoof wall on its own with time. The entire process, from an abscess first forming to when it exits the hoof wall, is typically about two weeks long. First, horse owners will notice their horse is lame and visibly in pain. 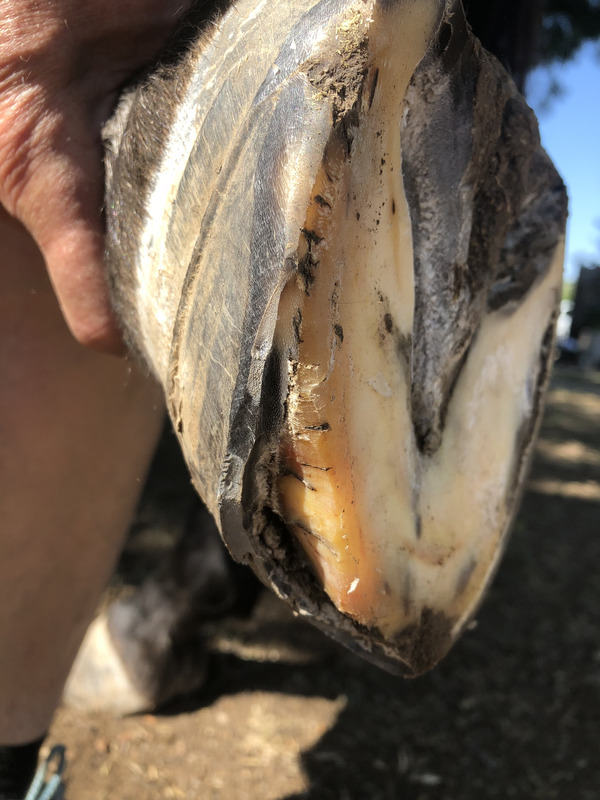 Shortly after, heat will cultivate in the coronary band, which means that within the next few days, the abscess will burst at the top of the hoof wall and below the hair line. Abscesses usually come out horizontally through the foot, and have about the girth of a pencil. Once the abscess bursts, it’s crucial for hoof care professionals to activate distinct trimming techniques to facilitate quick, even hoof wall growth and help horses become comfortable again. After the abscess is out, it will take time for the hoof wall to grow back over completely. There will be a bulge where the abscess busted, and the area under the bulge, usually about three-quarters of an inch, consists of dead keratin. This means that there is no connection between the exterior hoof wall and the lamina in that area. Although it may aesthetically look better to fill the spot with artificial material, doing so will only hinder the healing process. Hoof care professionals should avoid pouring material into that space in order to prevent infection and stimulate faster growth. Instead, hoof care professionals can cut away the dead keratin to facilitate growth in the affected area, similar to how humans trim hair. Additionally, opening up the space to fresh air ensures that no bacteria will get trapped under the dead keratin and lead to infection. Since the new hoof wall grows at a faster rate than the old, dead hoof wall, the new keratin will lap over the dead section. This is another benefit of cutting away the old keratin, because it ensures the new hoof wall will grow back smooth and straight. Depending on the size of the abscess, it may take a few trimming cycles for the hoof wall to fully grow back. Again, it’s almost impossible to avoid abscesses. However, it is possible to make the recovery process simple and effective. With proper trimming techniques, horse hooves will heal faster and help a horse become comfortable again. The hooves support a horse’s whole body, so it’s important for horse owners to maintain a regular maintenance schedule and keep hooves healthy. Talk with a farrier or veterinarian about how to handle abscesses and why proper trimming is vital to a horse’s health.